I was feeling a bit bummed out that I wasn't able to fly home for Mommy's birthday last week. It has been 2 straight years of me missing her special day and yes, I was feeling sad and guilty about it. I promise to make it up to her and Pan, most especially, in the coming years. Luckily, I haven't missed any of Papa's birthday and more so now as I really have to be in Manila yearly every end of August for family reasons. This is really one of those moments when reality bites that I am so far away from home and I'm missing out on special occasions like these. To make up for my absence, I decided to do something productive on Mommy's birthday and thanks to the Entertainer App, I spent my afternoon "productively" eating around Tanjong Pagar with my fellow foodies and friends Ting and Ning (...so call me Fing hehe). I've created a 1 minute video to share with you how my gastronomical afternoon went. 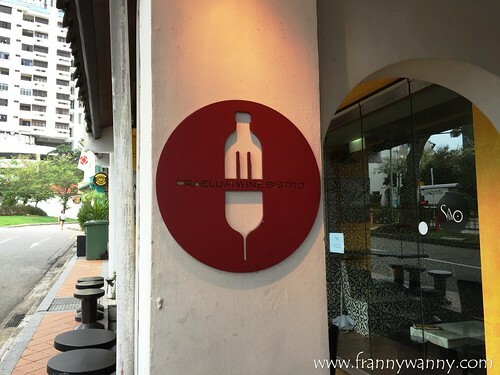 Our first stop was at Wine Mansion along Keong Saik Road. I frequent this place a lot as this is where my colleagues and I would head to whenever we're craving for burritos or burgers for lunch. Even my favourite salon can be found along this road too. Wine Mansion is a small cozy-looking establishments where it's the perfect place to hang out and unwind with a nice glass of wine and a few plates of yummy food too. I glanced at the menu and noticed that the specialties were pretty much Mediterranean-inspired. However, I can assure you that there's more to Wine Mansion than kebabs and tabbouleh. 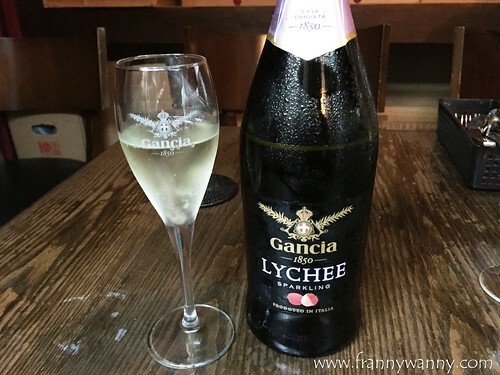 For starters, we all had a glass of Gancia Romino Lychee Prosecco (S$42/bottle). It was very light and bubbly, just the way I like it. As you know, I'm not really a fan of anything alcoholic so I appreciated the fact that we started with something very light. The worst is to feel woozy and buzzed all throughout the food trail. To go with this, we tried the Fried Chicken with Kimchi Yogurt Sauce (S$18). If only you can hear the crunch of this. It was crackling as I sliced into the skin and down towards the meat. Wow! For fried chicken fans, this is one item you shouldn't miss out on. Next was the Beef Koftas (S$16) which was my favourite in this stop. 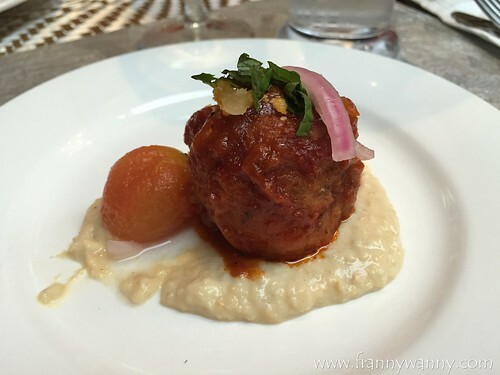 I love the meaty, chunky beef ball which sits on top of a creamy chickpea (hummus) puree. It's really yummy! Wish I can have more than one piece as it's really addicting. Note that these are all sampler size portions as we still have two more stops to go! Thankfully, we had to walk a bit towards Duxton Hill for our second stop. That helped burn off all the calories gained at Wine Mansion. It took us about 5 minutes to get to Praelum Wine Bistro where the owners warmly welcomed us in. It's so funny that I've been working in this area for 3 years yet I haven't been to any of these wine bars. Clearly, I focused way too much on food more than on the drinks. I'm glad I'm part of this food trail though as I now know two places whenever my colleagues are in the mood for some wine after work. 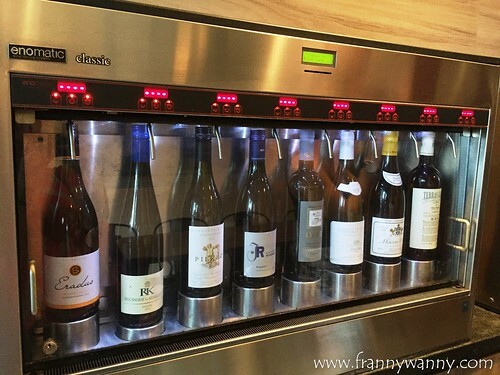 I was told that Praelum Wine Bistro is one of the first in Singapore to have an enomatic machine which allows patrons to sample the different wines without having to get it in full glass quantities. We tried two kinds of wine this time, the Reichsgraf Von Kessekstatt "RK" Riesling 2014 (white) and Bodegas Lealtanza Crianz 2011 (red). Never to champagne, I love white wine and I have to say that the RK was indeed a pretty good one. While I'm no avid wine drinker, one thing that I enjoy with wine is definitely the food. We tried 3 of Praelum's signature dishes that afternoon and this time, they served it in regular portions for 3-4 of us to share. 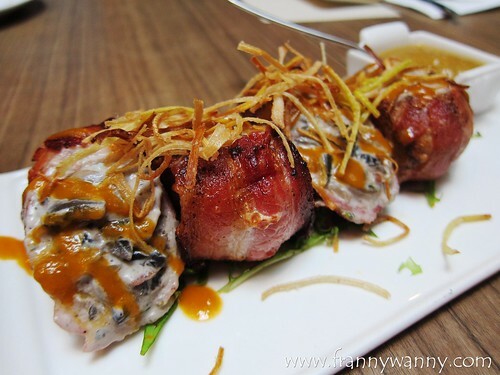 First was the Pork Parcels (S$27) which is a genius creation made out of pork fillet stuffed with a creamy cheesy herb filling, rolled and secured with a slice of pork belly before it gets roasted to perfection. I had very low expectation for this so just imagine the fireworks that went off in my mouth as I had my first bite. To say that it was amazing would still be an understatement. 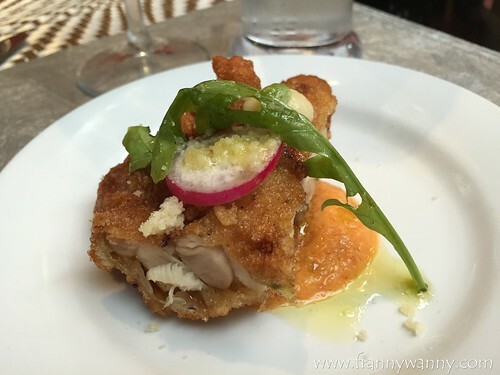 For this, I'm definitely going back to Praelum Wine Bistro more often now. 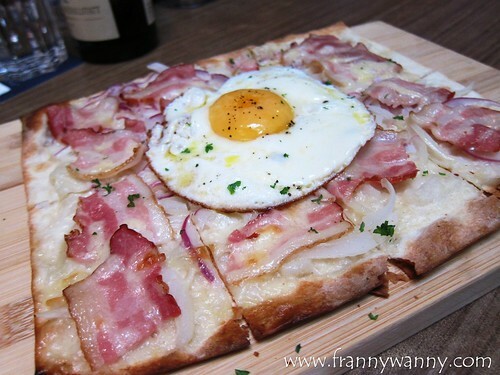 If the Italians got pizza, the Germans (or at least Praelum) got Tarte Flambee (S$20). I think this is their most popular dish as most of the blog reviews have tried and mentioned this. Similar to a pizza, it makes use of bread dough which was thinly flattened and is topped with all sorts of ingredients. That afternoon, we sampled one that has creme fraiche, onions (lot of it! ), bacon and a sunny-side up egg on top. The only thing I didn't like about this was the abundance of sliced onions but other than that, I love how each bite gives you that good balance of creaminess and a slight salty kick from the bacon. It's a fun thing to order especially when you're dining out with friends. One order may be shared by 2-3 pax. We also tried the Salmon-en-Croute (S$32) too. It's actually my first time to try this dish and it's really interesting. 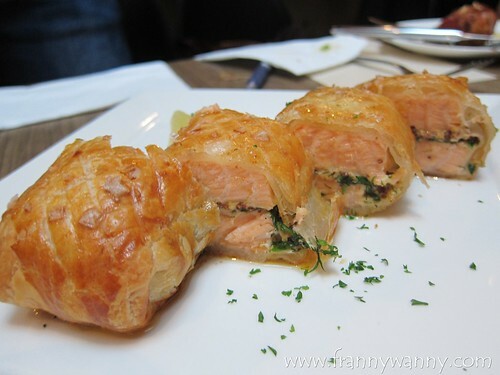 I love the flaky yet really tender salmon fillet with spinach cream filling wrapped in a buttery puff pastry shell. It makes for a good afternoon cocktails snack as it's a really yummy and classy baked pastry. Oh, at this point, I was starting to feel very full already. But we still got one more stop to visit and no way am I not eating at MeatLiquor! This was actually my 3rd visit to MeatLiquor and still, I was so excited about heading there as I can't wait to have whatever they have prepared for us. 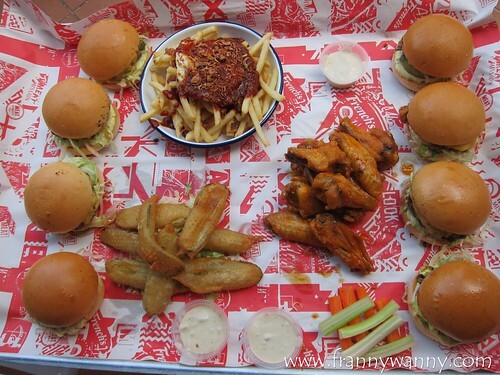 Despite most of us saying how full we already are, we still feasted on MeatLiquor's signature items. First was the Dead Hippie Burger (S$22) which has been my all-time favourite. I just can't stop raving about the double meaty beef patty with MeatLiquor's secret dead hippie sauce, lettuce, pickles, cheese and minced onions all packed in a really delicious bun. 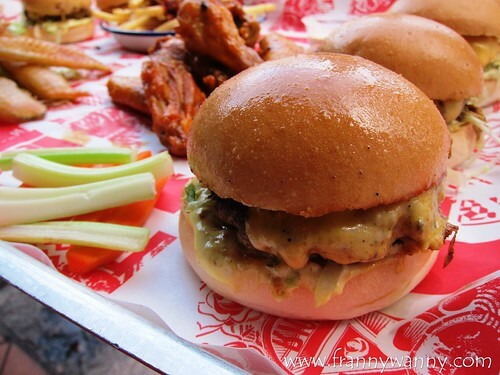 Actually, MeatLiquor has a lot of burger options to choose from but I always get the Dead Hippie every single time. We also had the Shambal Fries (S$12) and Buffalo Wings ($15) but what surprisingly captured my heart was the Fried Pickles with Blue Cheese Dip (S$9). I can't believe it. For those who are not really into pickles like me, you have to take a bold step and try it. Trust me, I went back 2 days after the food trail with my girl friends V and A and even V was blown away. That was after she told me that she doesn't like pickles. 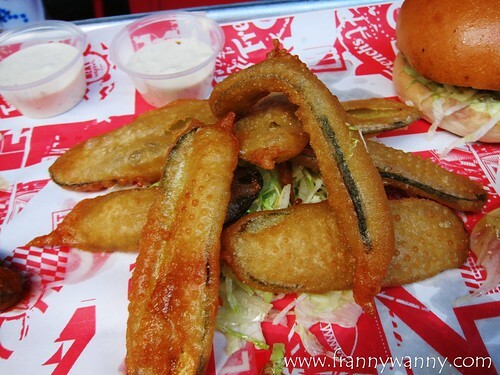 What makes this special is the tasty coating that complements the slight tangy pickle flavour. It was delicious and no visit to MeatLiquor will ever be complete now without ordering this. Seriously. I'm in love love love! 3 stops. 1 afternoon. An amazing food adventure as we visited these Entertainer App merchants. Now that I have the 2016 Entertainer App (S$85) installed in my phone, I can't wait to check out the new merchants and to go back to my all-time favourites while enjoying our 1-for-1 deals. I think I've been raving about this awesome mobile app for 2 years now and you have no idea how many of my friends have also went ahead and purchased this as it really gives so much value for your money especially if you love dining out and traveling just like us. I also find so much satisfaction in checking how much I was able to save too. Check out the list of merchants and learn how to download here. Also, visit my Entertainer App tab to see the different restaurant reviews that I've written about some of its merchants for the past two years. 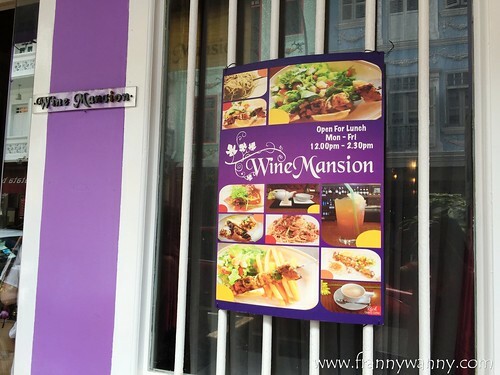 Wine Mansion is located at 20 Keong Saik Road, Singapore 089127. Call them at 6532-4338. Praelum Wine Bistro is at 4 Duxton Hill, Singapore 089570. Call them at 6238-5287. 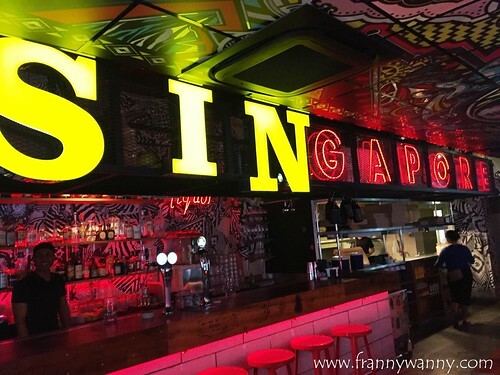 MeatLiquor SG is located at 99 Duxton Road, Singapore 089543. Call them at 6221-5343.